I was sharing a townhouse with a co-worker, who owned the home. One evening I noticed police activity outside, so I went out to see what was going on. I stayed a respectful distance from the event, which appeared to be a traffic stop. While I was watching the events, a cruiser pulled up to my house, and two officers got out and approached the door. I followed them up to the door, and asked how I could help. They asked if I was the owner of the home, and if I was the owner of the car in the driveway. I wasn’t, and told them so. They asked if he was home. I told them that I didn’t know, but that I’d check. As I went inside, the officers began to follow. I stopped and turned, now inside, with them outside. One asked if they could come in. I said, “No, sir.” The officer responded with threats of imprisonment for obstructing justice. 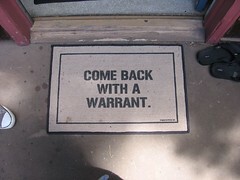 I was incredulous, and asked to see his warrant. He stated that they just wanted to ask him some questions. I stated again that I would look for him, and began to close the door. The officer said, “Leave the door open.” I said, “No, sir.” He said, “If you’re not hiding anything, why won’t you leave the door open?” I replied that I did not consent to any searches of my person or property. The officer said that they could go get a warrant. I advised them that perhaps they should. In the meantime, I would go see if the owner was home. When I returned and told them that he wasn’t home, they asked where he worked, what his phone number was, etc. I stated that they would need to ask him directly for that information, that I was not willing to divulge his private information. They again threatened me with obstruction of justice, and said that they would go to his office and arrest him. I advised them that that would be their best course of action. End result: They were fishing for a confession from my co-worker about racing. They didn’t have enough to get a warrant, and nothing more ever happened. I firmly believe that had I not been aware of my rights, the evening would have gone much differently.